Kiawah Island presents an unparalleled opportunity to relax in nature in its many forms: marshes, rivers, maritime forests, and the soft, steady rhythm of the Atlantic Ocean. But that doesn’t mean life on Kiawah is without its conveniences. 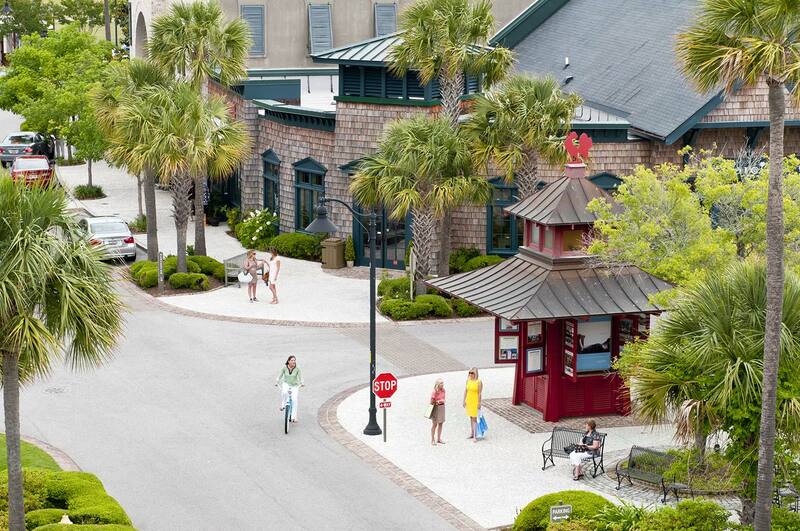 One of our favorite places to eat, shop, and enjoy is Freshfields Village. You’ve probably passed this tidy, attractive town center on your drive into the island — maybe you’ve even stopped in to pick up some beachfront reading material from Indigo Books or groceries from Harris Teeter. The Village is also a prime spot for date night, with charming restaurants like Forty-Eight Wine Bar and La Tela Pizzeria. Need something to wear? Freshfields has you covered (literally) with fun, vacation-inspired threads from shops like Lilly Pulitzer and Coastal Footwear. So maybe you think you’ve seen, shopped, and tried it all at Freshfields. Think again! Freshfields Village is now home to new tenants, relocations, and an expansion. Check ‘em out below, and don’t forget to stop by our Kiawah Island Real Estate office while you’re there. Once you call the island home, you can experience all Freshfields has to offer whenever you please! What’s not to love about a big, decadent scoop (or two) of Ben & Jerry’s ice cream? This beloved ice cream company entices with flavors as delicious as they are fun: Phish Food, Chunky Monkey, and Americone Dream are just a few of their top flavors. At the shop, you’ll find a wide, rotating selection of flavors plus non-dairy options, ice cream cakes, and catering. All Ben & Jerry’s ice cream is kosher and certified non-GMO. That makes it healthy, right? Create your own custom scent for your home or for yourself at this unique shopping experience. At the Scent Studio, experts will custom blend a scent just to your liking for a candle, room diffuser, room spray, or fragrance oil. If the thought of creating your own simply sounds like too much pressure, this local company also has 130 of its own, existing fragrances to choose from, all designed to delight the senses. Any Palmetto Scent Studio product would also make a great gift! Modern, casual sophistication is the go-to style at this new boutique, which focuses on garments that are both beautiful and functional for women on the go. Everything in this shop is lightweight and comfortable, designed with travel and movement in mind. Don’t miss the shop’s own Tees by Tina line for the softest t-shirts ever. Originally out of Greenville, Cantina 76 has enjoyed success that’s spread throughout the state. Its Fresfhields location opened back in October, but if you haven’t tried it yet, make sure you do! This spot offers creative twists on tacos, like the Peruvian shrimp taco with jalapeno coleslaw and sesame-chili drizzle. Pair the Mexican-inspired food items with a tequila-based drink. The restaurant’s signature Cantina Margarita is a refreshing choice. Southern Tide has been a part of Freshfields for a long time, but what you might not know is that the shop has recently expanded with a bigger and better new storefront! Focusing on craftsmanship and classic style, Southern Tide is a favorite on the island for casual wear from top clothing and accessories brands like Jack Rodgers, Escapada, and Sail to Sable.